Between 1543 - when Europeans arrived in Japan - and the 1640s when the country was closed to foreigners, the Japanese had regular contacts with the nanban-jin (Barbarians from the South). These merchants and missionaries, mainly from Portugal, were the source of a theme in Japonese art in the XVIth and XVIIth centuries. The paintings that decorated the nanban byobu (folding screens) depicted an extraordinary confrontation of civilizations ans its beauti is captivating. Through paintinf primarily done buy the Kano school, the history of Portuguese arrival in Japan unfolds beofre our eyes. Sometimes critical, sometimes joyful and festival, the byobu reveal the beginning of Asia's Westernization. 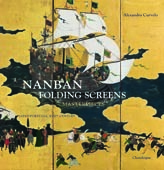 Nanban Folding Screen Masterpieces presents thirteen of these byobu accompanied by text about the fascinating history of the commercial, religious, and cultural encounters between Europe and Japan in this era. The book brings together folding screens from the Nanban Bunkakan Museum of Osaka, the Municipal Museum of Kobe and Museu Nacional de Arte Antiga de Lisboa - where the most important collections of nanban art are found-, as well as the Victoria & Albert Museum of London, the Rijksmuseum of Amsterdam, Musée Guimet of Paris, Museu Soares dos Reis in Porto, the Museum of History and Culture of Nagazaki, and the Idemitsu Museum of Tokyo, as well as a folding screen from a private American collection. Chefs-d’œuvre des paravents nanban. 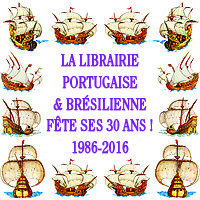 XVIe-XVIIe s.